Christiano Ronaldo's son joins him (Ronaldo) in Juventus under the Youth Academy. 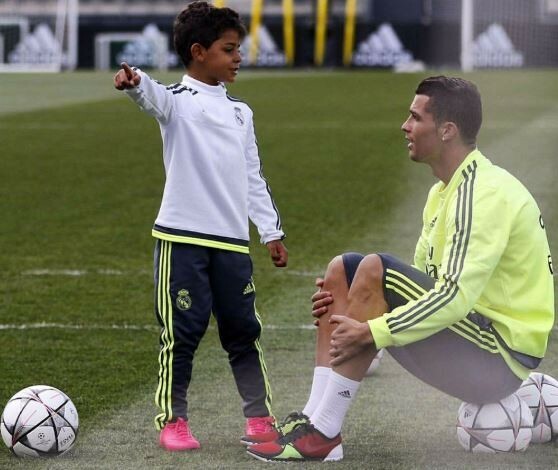 Cristiano Ronaldo’s son has officially joined the Juventus development side just days after Ronaldo claimed Cristiano Junior will follow in his footsteps. Ronaldo, 33, joined Juve this month in a club-record deal and relocated from Madrid along with his whole family. The five-time Ballon d’Or winner recently told DAZN that he is ‘100 percent sure’ his first-born will emulate him on the football pitch. He’s not the only son of a senior Juventus player, as Mattia Barzagli has been in the Juve side for a couple of years along with Davide Marchisio, the son of club legend Claudio. We believe he is going to be a very good player just like his father.